Another day, another task I’ve decided to start doing on the command line. After setting myself up with Twitter CLI and abandoning it shortly thereafter (the command line interface strips Twitter of its actual magic, I feel), I moved onto Gmail, excited by the prospect of swiftly sending and receiving emails without having to greatly interrupt my development workflow. Introducing Mutt. 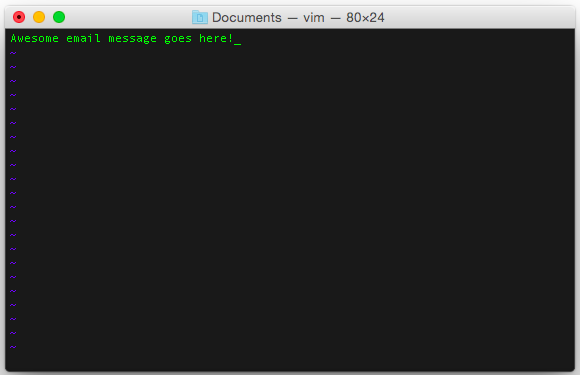 This awesome email client for the command line goes all the way back to 1998! When you’re done, press Control-O (to Write Out) followed by enter. Then press Control-X to exit nano. I bought some things at some places and now they own me forever. If, like me, you’ve gotten into the habit of never deleting any emails, you’ll see a massive output when you first start Mutt. It may be overwhelming at first, but soon you’ll learn to set some configuration options that will help you sort and filter your emails with simple key commands. But first let’s start by sending an email. You can pick an email from your list to reply to and press r (reply), or start a brand new email by pressing m (mail). If you chose to start a new message, Mutt will first ask if you want to ‘recall a postponed message’, i.e. a draft. Press y (yes) to be taken to a list of drafts in your account or n (no) to create a new email. Mutt will then prompt you to specify a To address and a Subject. 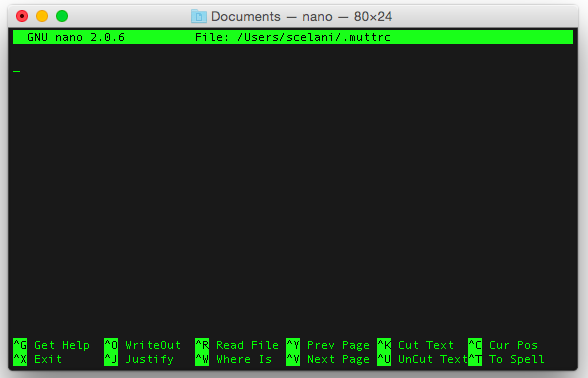 Vim is another Terminal text editor like nano, but with its own unique commands. If you’re totally unfamiliar with it, you might want to reference a Vim command cheatsheet, but for the purposes of this exercise, only a couple of basic commands are needed. Press i (insert) to start typing your message. Once you’re done, press the ESC key, followed by :wq (write and quit) to exit Vim. From here, press y to send your email. You did it! 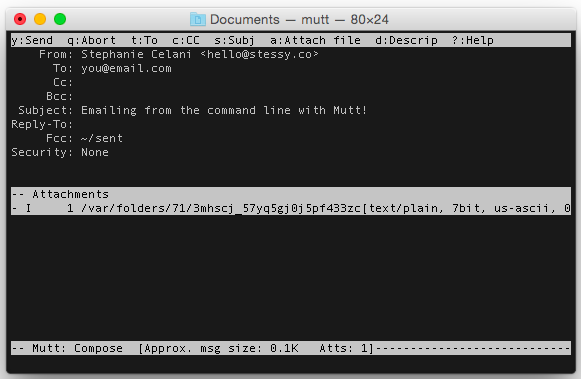 Now that you’re command-line emailing like a pro, let’s configure Mutt to best suit your needs. 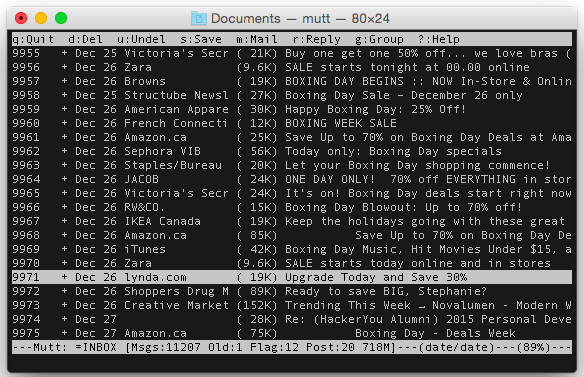 Using Mutt’s ‘limit’ command to filter emails. Out of the box, Mutt will return you every email in your inbox and you probably don’t want that. Mutt’s ‘limit’ feature lets you ask for emails according to date, subject, sender, unread status, and more. This is just a small sampling! To see all of the options available and how to use them, refer to the Mutt docs. Creating shortcuts for limit commands. If you have a long or complex limit command, you probably don’t want to have to type it out in full each time. For example, I typically like to be shown emails less than 7 days old and having to type l ~d<7d every time I use Mutt is decidedly unideal. This means that when I press .. on my keyboard in Mutt, it will trigger the limit feature with the option ~d<7d which will return emails less than 7 days old. Not bad at all! Unlike most email clients, Mutt does not come with a ‘check mail’ command that will pull in any new messages while you’re already inside the program. So let’s create our own! Pressing G (get) in Mutt will now fetch any new emails from the IMAP server. I hope this tutorial was useful for anyone wanting to integrate Gmail into their command line interface. Mutt can be configured for other mail providers. Please see Mutt’s extensive documentation to learn more about the awesome things you can do with it.